I want to make this for a crowd….15 people. If I quadruple this, will it turn out okay? I’ve had bad luck doubling recipes in the past, and since i need to make so much, I want to make sure I do it alright! It would be difficult to quadruple this on the stovetop. You might need to modify by cooking four batches of the sauce, then placing all four batches into a large roasting pan and cooking the eggs in the oven. Overall there shouldn’t be a problem quadrupling the sauce recipe, but keep an eye on the liquid content and if it seems overly watery, cook it down until the liquid evaporates and the sauce thickens. 2) Crack eggs into it and simmer until eggs cooked to ‘over-easy’ state. Seems much quicker and simpler. 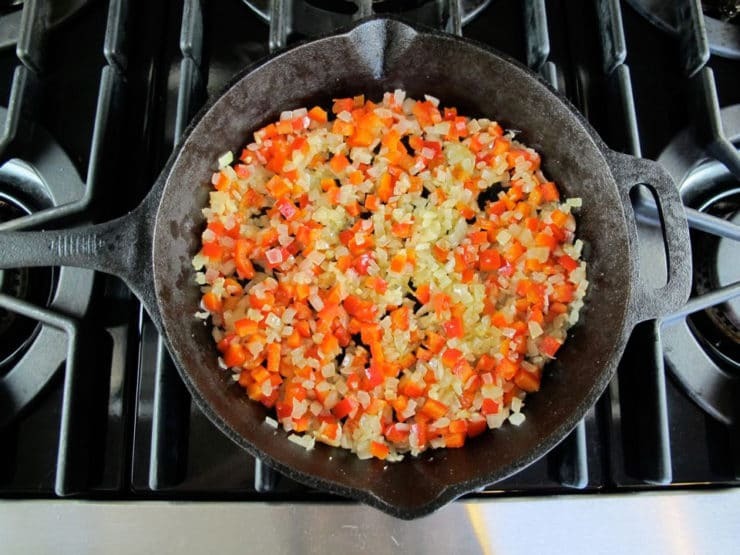 Sautéing the veggies can add to the depth of flavors in a dish, especially when you cook the hardier of spices and herbs with them. Why skip a step that might make or break the recipe? Hmmm, perhaps because this is an authentic recipe? Enjoy your simple version. Absolutely delicious. We used our hen’s fresh eggs and the yolks were like bars of gold. I cooked the eggs in the sauce until they were just set which was perfect – not funny but not hard-cooked either. Left out the Peppers because my tummy won’t tolerate them. Also didn’t have cumin somfor spices I used: 1T sugar, 1tsp harissa seasoning, 1TBSP hot curry powder and 1tsp Moroccan curry powder that is heavy on the fenugreek. Salt and pepper of course. That’s what I had on hand and it was OUTRAGEOUSLY good. I served with a very high hydration, super crusty sourdough slathered thickly in butter. The richness of the buttered bread against the complex tomato stew made me drool it was so good. THe egg yolks cooked to this doneness were like little treasures. So good! It was also super easy to make. Oh and i fried all the spices with the onions and garlic. I used avocado oil for higher heat to liberate the flavors of the spices. my daughter tried it at her friends place and they had a can of baked beans in it! has anyone heard of that? I am so excited to find this recipe. We just returned from Israel this past Sunday. It was amazing. The hotel we stayed at in tiberias served this and it was so good. They also made porridge and served a wonderful cinnamon spice blend with it. Now if I could only find the recipe for that. Shakshuka is one of my all-time favorite dishes to make and your recipe brought me back to the many meals I had at Dr. Shakshuka. Instead of a side salad, I served it over a bed of spinach. The warm eggs wilted the spinach just enough. It was perfect! 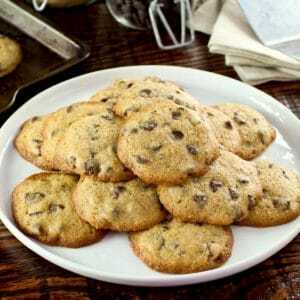 So simple, and the most amazin things – it’s from ingredients that you usually have at home! Super tasty, use it for breakfast or light dinner with a toast. Great recipe! It looks just like a local dish we have in Ghana called Koobi stew but it has dry pickled fish in it plus the eggs. Lovely! I made 1/2 recipe for breakfast this morning. It was so delicious my husband and I ate every bite! I added chopped spinach to the dish and garnished with sliced black olives. This recipe is going in my recipe box. How do you know when the eggs are done enough to be runny? Made it and it was excellent. Some of the eggs started to cook too much though. Hi Nick, Tori’s assistant Ashley here. The easiest way to tell is by how opaque the yolk looks. The more solid/light yellow/opaque it appears, the more done it is. It’s really something that you will become easier to recognize the more you cook it. If you gently press on the yolks you should be able to tell from how firm they are to the touch. It should be born to mind that they’ll continue to cook once served. My first egg was perfect but by the time I got to the next it was verging on hard. I really want to try this it sonds like my kind of dish. but I live with my son and DIL and he is a real meat eater. So i am thinking of fixing bcon or sausage on the side for him. and maybe some hash browns?? There’s a local restaurant that crumbles merguez sausage right into the shakshuka, and it’s delicious! I’d like to try this dish by starting with some ground lamb. I’ll probably use more garlic and throw in some allspice though. And parsley is NOT an option, but a necessity. Mrs. Avey, you are the reason I got into cooking. I first made your shakshuka recipe when I was sixteen and was dating an Israeli. You inspired me to try and make different ethnic dishes, my favorite recipe of yours is for Israeli salad. I most recently made your Kobete. My parents and siblings loved it. I just wanted to thank you and to let you know that your work is appreciated. That is so kind of you, Richard! So nice to hear from you. 🙂 Thank you for writing. So true. 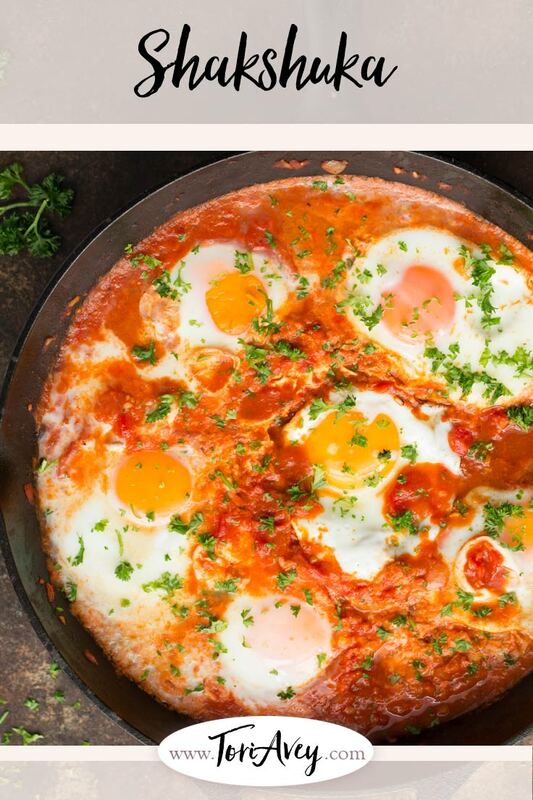 I used to think that shakshuka is a middle eastern food (yemen, to be exact) but now I know it’s not. But anyways, I love shakshuka. 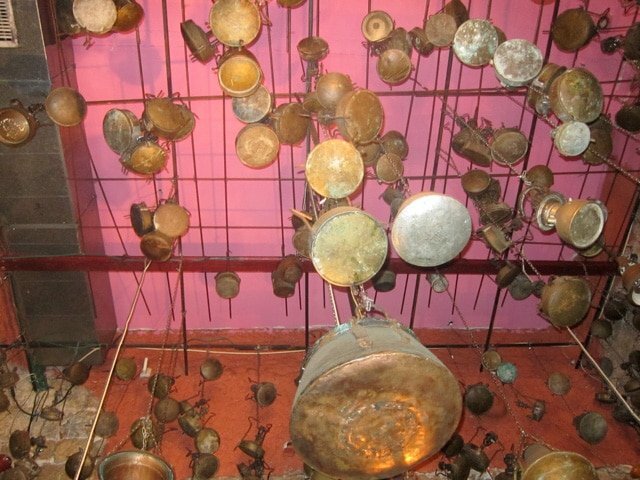 My mom used to make it for me and my siblings in Yemen and we love, love, loved it. It was our favorite breakfast meal. But like you said, we sometimes ate it for lunch or dinner when we wanted something easy and delicious (other than pizza; ordering). Tori Avey, I just want to ask you: Are you from Israel? 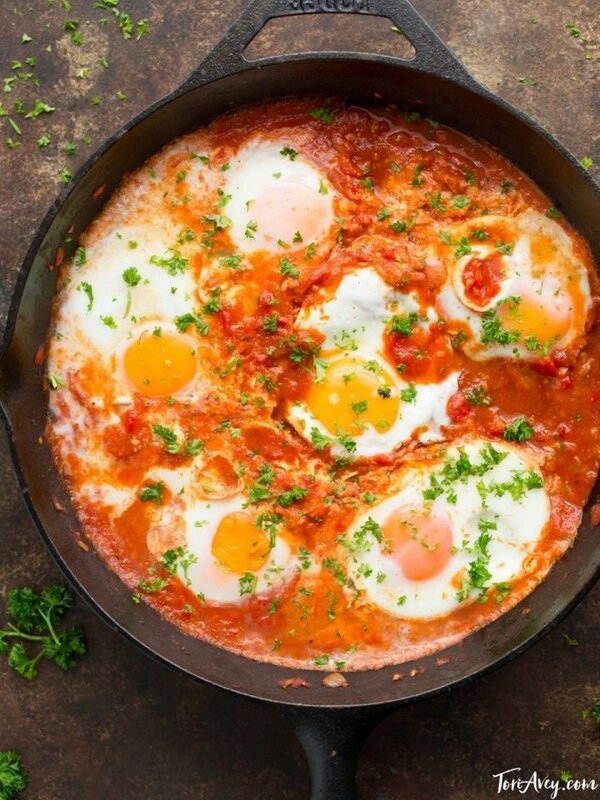 Shakshuka is North African in origin, but it is popular throughout the Middle East. Dr. Shakshuka is a Libyan restaurant. I am not Israeli, but my husband is. I love Yemenite food! SHAKSHUKA. Brilliant recipe, with many possible variations, all good. Why has it taken until I am 80 to discover this style of cooking. Fortunately I am able to pass the recipe on to my children. I have been able to research the recipes by Claudia Roden and Ottolenghi on Mediterranean cooking, and have found them a complete revelation ! Better late in life than never!! Made this for lunch today and it was so good. I added portobello mushrooms to mine. Delicious! I am from Yemen, and this is a dish my mother made for me and my brothers ( I was about 3 years old) and she would put cheese on top and season it with green onions. It was soooooo delicious. You should try it too @JW. ???????????mmmmmmmmmmmmmm……….mmm..mmm.. So good! I came across this recipe looking for low carb healthy meals and wanting to try something other than the basic chicken breast. I added ground turkey for some added protein and to make more filling. Looking forward to making it again! I have used this recipe on the regular for months now (so much so I have it memorized and don’t need the website anymore.) I just spent a ten day trip in Israel and actually went to Dr. Shakshuka! I knew it looked familiar but had never been to Israel before so couldn’t figure out where I recognized it from. So glad I realized it was your blog! I heard about this dish yesterday morning and ended up using this recipe to make it for dinner. Absolutely delicious! I scaled it down for 1 person and served it with warm bread, steamed broccoli and red wine. I’ll definitely be adding this to my regular menu items. Wow, really simple straight forward recipe. I enjoyed it thoroughly. Any comment on the spices you used for the Indian technique? I don’t know much about Indian cooking but I’ve been meaning to get into it. @ Mario, I just made it using the Balti spice blend from Penzey’s (penzeys.com) and it was fantastic! I just substituted the Chili powder for the Balti and sautéed the spices with the onion pepper mix before adding the liquid. Good luck! This was a nice change to typical bacon and eggs I eat for breakfast. My daughter even ate some as well. I did have to put it in the oven to set the eggs for about 7 minutes at 350F. Amazing! It looks good in the photo, but tastes better. I’m tired of scrambled eggs and bacon, this is definitely worth the effort ???? Marvellous, – a great working recipe that let me work with what I had at home (no cumin, coriander instead of parsley) and still turned out well. 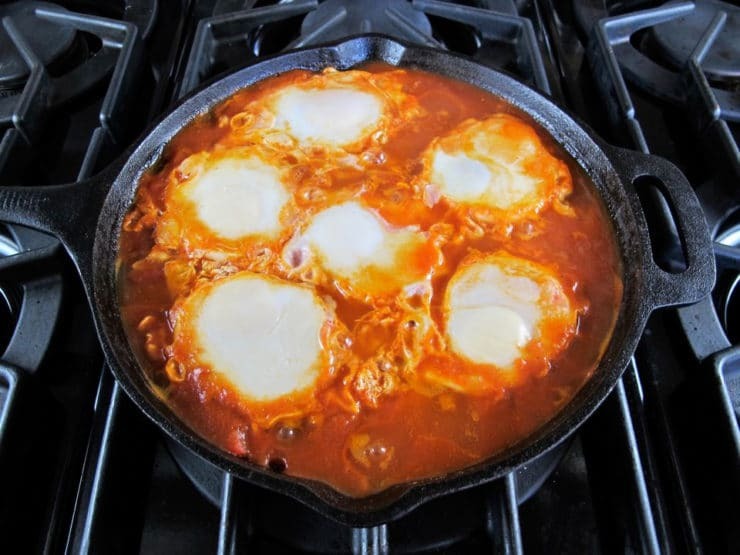 Tori’s recipe is my go-to Shakshuka recipe, it’s a great recipe and I love her stories about eating Shakshuka in Israel. One shortcut I do if I’m short on time or don’t have green peppers, is to use 1 part salsa and 1 part crushed tomatoes. I just “toast” the spices in the oil before asking the liquid ingredients. A Mexican variation I’ve made is to use a bit of mole’ too. I made this recipe for the first time on my birthday. It was great! 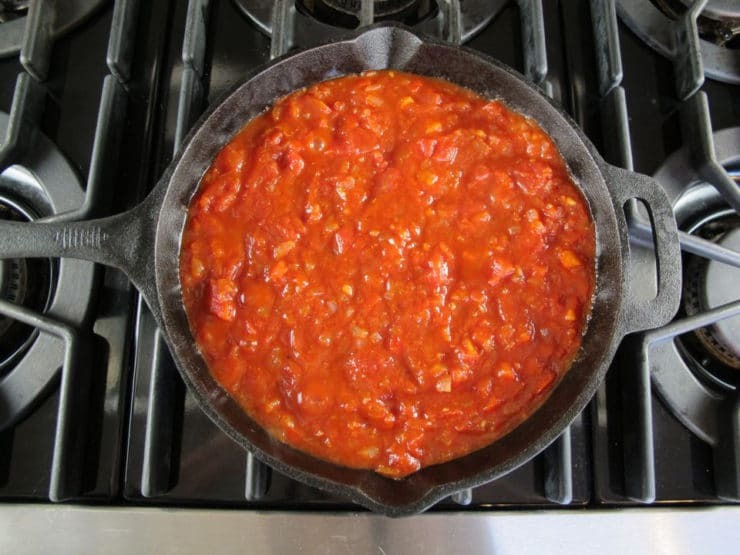 To add some extra flavor, I used fire-roasted diced tomatoes and enjoyed the flavor profile that resulted. I also used some roasted chickpeas and the fried olives and garlic mixture recipe from The Joy of Kosher to top the shakshuka after cooking and would recommend their addition highly. I will look forward to making more of your dishes. Turns out I’ve been making a version of shakshuka for years and had no idea- my version is almost exactly the same, but I also usually dice one potato pretty small and add green onion! I didn’t know this was an actual dish, but it’s one of my favourite winter dinners. Thank you for posting! 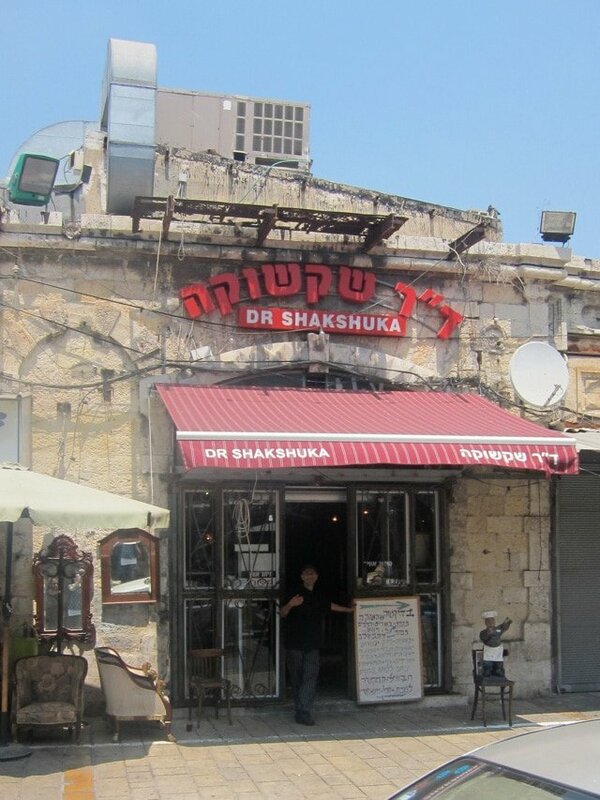 If I ever travel to Israel, I’ll try to make it to Dr. Shakshuka’s! Just had this as our delicious dinner. Will defintiely make again. 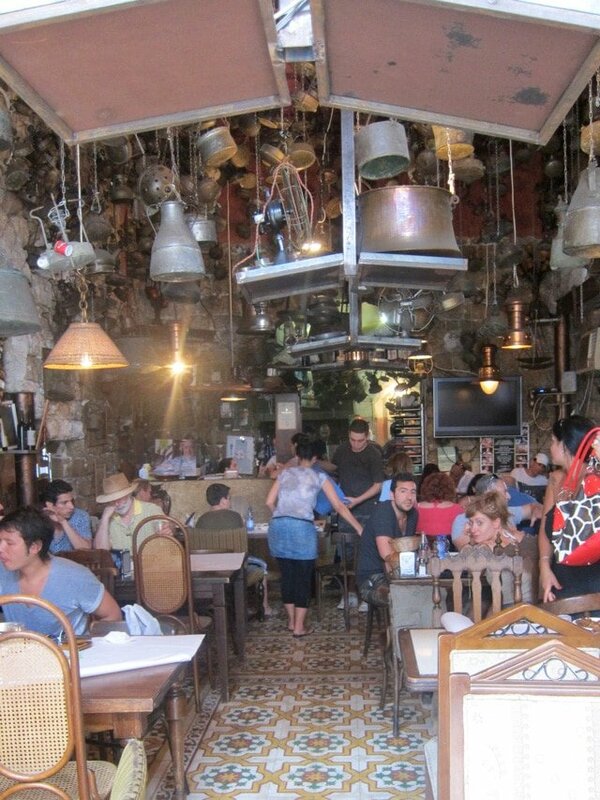 Did not make it to Mr Shakshuka when we were in Tel Aviv a few years ago. Thanks Tori, I loved your recipe, made a few changes for fun the second time. Added a teaspoon of Garam Masala and a 410 ml can of drained 4 bean mix, some frozen spinach and sliced salami. Thank you , this dish has become one of my staples. Kale and a can of drained chickpeas is amazing in this dish. Save the aquafaba (the cooked bean water) and look up recipes for its use. Love your recipes, my go-to place for israeli recipes to make my Israeli husband happy :). Thank you! Try Some goat cream cheese on the top as you add the eggs ??? Thanks for this delicious recipe. We only used one can of diced tomatoes so we could have omitted the sugar. The natural sweetness of tomatoes is enhanced by the reduction. Shakshuka on the table and Leonard Cohen on Spotify make for a lovely morning. Lovely story, tasty recipe! Thanks a lot, Tory! I think I might try it tonight, maybe with some zucchini for extra veggies for my kids. I am sure they’ll love it. 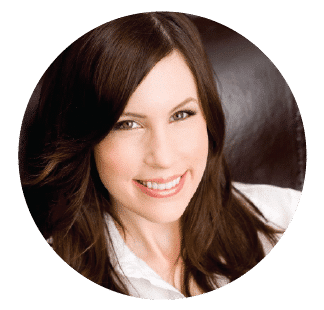 My daughter is diabetic, so it’s a great option for low carbs (near zero!) for her. This was really tasty. I made some tweaks for my taste (such as blending the sauce so there are no chunks!). I also only threw two eggs in because I wasn’t sure how this would keep, but now there is a bunch of sauce eftover for next time! I definitely love reading all that is posted on your website.Keep the information coming. Trying to cut down on carbs and found this looking for a good breakfast egg recipe. Wow! Love the richness of the tomato and the warmth of the spices. My small eggs cooked in about 5 mins so whipped them off the heat while they still had a slightly runny yolk. Will definitely make again and explore your site….. Delicious! I added mushrooms and spinach and cilantro great healty breakfast. The key to making it great is make sure after you fry the vegetebales and add the tomato paste then add the eggs cover the pan and let it cook for 10-15 minutes until the eggs rise. The steam adds moisture and the eggs become fluffy and delicious? 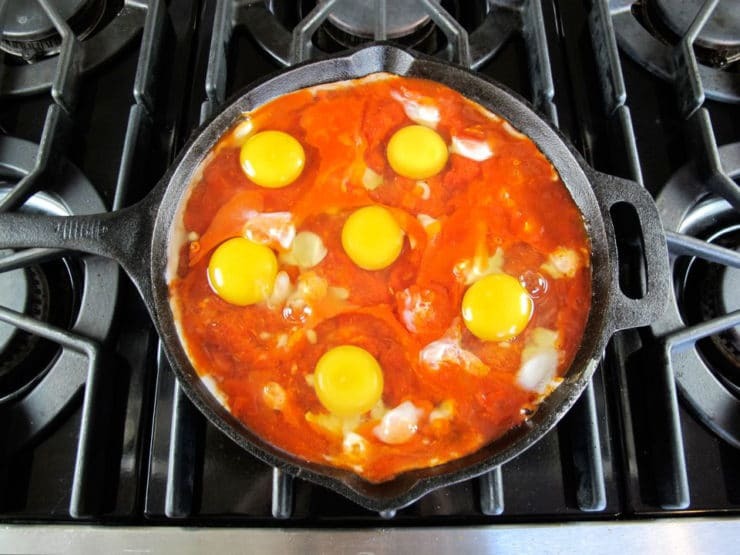 Israeli girl here… As a long-time maker and appreciater of good shakshuka I have to say, Tori, your recipe is great! I just made this for dinner using the ingredients you listed plus, inspired by your description of other shakshukas, I added mushrooms and roasted corn, and garnished with fresh parsley and cilantro (and a sprinkle of za’atar). The result was both beautiful and delicious! Thank you! I absolutely love this recipe, it’s my ‘go to’ easy dinner. We have it with Cous Cous just to make it a bit more filling! Nom nom! Thank you ? I love shakshuka. I normally cook it on Sunday mornings when my grown up kids come to visits me. I like to add Feta cheese on top of the eggs few minutes before removing the skilett from the fire. Hi there! I really like this recipe. I like my eggs cooked very well done. (Pointing this out because of my question).) Do you think this would freeze ok? (If I liked them runny, I know this would not work). Also, how long do you think it would keep in the fridge? I’m trying to cook stuff ahead for my work week and can’t wait to try this! Hi Brianna, Tori’s assistant Ashley here! I would not recommend freezing or refrigerating this recipe with the eggs. For best make-ahead results, I would make the base ahead of time and keep it in the refrigerator for no more than two days. Add the eggs just before serving. Absolutely fantastic recipe! We doubled the garlic, chopped the plum tomatoes, added white wine to the onions and peppers occasionally and substituted goat chevre for the feta. We simply cooked the eggs in the sauce with a lid on the pan on medium heat. Absolutely delicious! Great for a cheap, easy, nutritious, low calorie meal. I’m a student and believe this will definitely become a staple for the rest of my life. I made your recipe for the second time, almost exactly as you gave it: no cayenne, double the onion and 6 cloves of garlic. I even used the same cast iron pan as pictured. The recipe works perfectly, and it made a very good supper. My wife liked it too. The chili powder and garlic supplied sufficient heat, so the cayenne was unnecessary. We’ll make it again. Thanks. Just saw an article printed about shakshuka and was intrigued. Then a good friend who is opening a brand new restaurant said she was putting it on her brunch menu. I had to try it! Saw your recipe, made it this very morning and loved it! Just the right amount of heat to it, perfect eggs, relish!! I am trying for the first time.. I have seen this made on my cooking shows and now I’m going for it!! Daughter wants meat.. Lol I didn’t know you could put sausage in it..
Great base recipe and comments. Meats, fowl or sausage variations abound (18 years in ME) but I have found a favorite Moroccan version seasoned with Ras A Hanouf, with or without cooked lentils or chick-peas. Lamb mince is my favorite but have tried chicken, turkey, fish and even shrimp successfully. This is a great meal with whatever leftovers in the fridge too. Now if I can just find a recipe for some good Afghani bread……..
OMG! That looks amazing! 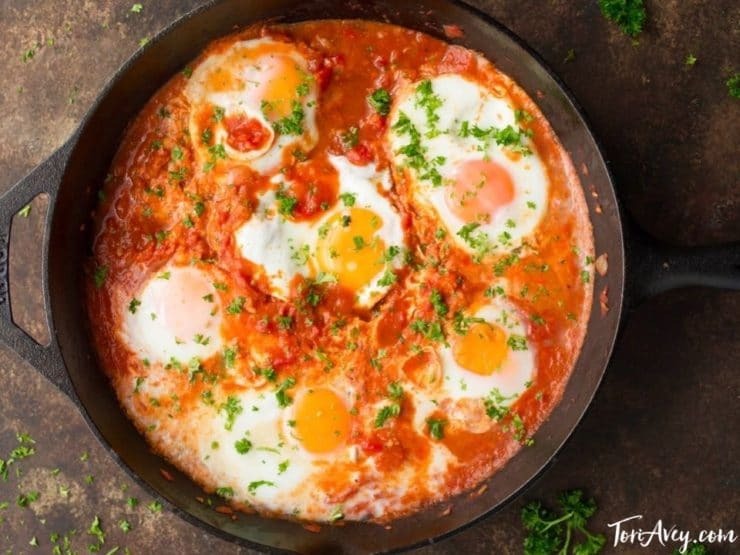 I’ve only ever tried the Shakshuka without the eggs, so will definitely be giving this a try for breakfast! Had a chance to make this the other day for some company. While I’m not a fan of peppers, I added them anyway. Followed recipe exactly and was greeted with effusive praise. Served with a salad and a freshly baked baguette. Would make this recipe again – was a hit. 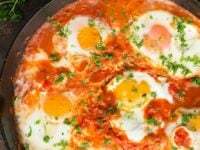 This is my favorite Shakshuka recipe on the internet and I send it to everyone regularly. 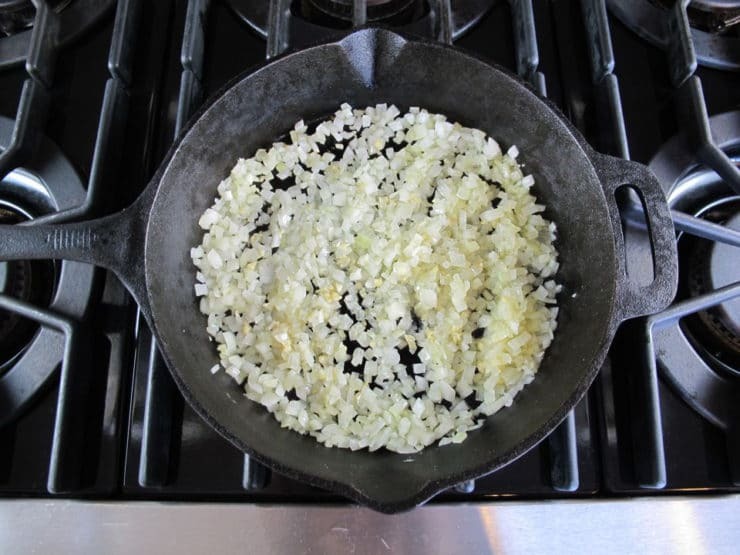 I have made these changes: I use a whole onion (instead of 1/2), two peppers (instead of one), and 3-4 cloves of garlic. Also I cook in a mixture of clarifed butter and olive oil. For add ons, I use jalepeno, mushrooms (cremini or shitaki) and either parmesan cheese or feta. The mushrooms and jalepeno should be cooked together with the peppers. Jalapeño + shitaki + parmesan seems to be a hit! My hubby and I ate here but had other things to eat. I tried this recipe when I got home[ and realized we stumbled on a famous hot spot!]. Delicious. Since I’m a vegan I substitute slices of silken tofu and the texture is just like the eggs! taste terrific. My mother, an Italian, made this when I was growing up! I have been on the lookout for such recipe. Thanks for sharing! I discovered this recipe a couple of years ago when working in healthcare in a group home. My clients all loved it, and I managed to convince my co-workers that it was a great healthy, easy meal to cook for dinner, and that they should try it themselves. This dish was so tasty! Served it with flatbreaded top with Kalama olives spread and feta cheese. Will surely add to my family’s menu. I am a egg lover and this dish reminds me much of the Mexican breakfast dish called Huevos Rancheros. This site requests a side salad but I added skirt steak and corn tortillas and it made the perfect meal!!! I’m glad to have found your site. You have many exciting recipes I’m excited to try. My son recently returned from a Birth Right trip to Israel. He had shakshuka for the first time. I have never had it. I’ll give your recipe a try this weekend. It was great!!! I just made only i added liced lamb, instead of cous cous, i used creamy grits, and it came out wonderfully!!! Im gonna make the more often!!! Thank you for sharing this dish and your recipe. As a bachelor I need simple meal ideas, and this fits the bill perfectly. 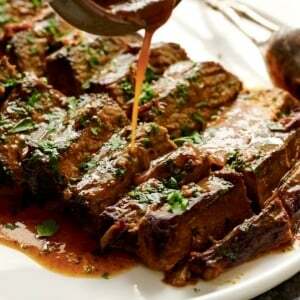 Don’t let it’s simplicity mislead you, as this dish packs some great complex flavor profiles! My edits to the recipe were to add a tablespoon of cyane pepper instead of chili powder, and a crumble of feta at the end. Shakshuka has been my go to meal for years now!! I like to add some cheese to it for flavor though, really adds something scpecial. I usually use Gouda or mozzarella. You should try it! I did not care for this dish, neither did my family. Too tomatoe and cumin. Just not for us. You can add minced meat! Thanks for the recipe, I had this in a restaurant and was so amazed at how simple and tasty it was. I had to make it at home, and used your recipe. I make it with one egg in a 6 inch skillet for a low calorie, healthy meal for my lunch- when I’m home. I too like spicy and my eggs non-runny! My wife just made this for me – delicious! With a little feta, pepper and parsley, it reminded me of some of the best hotter italian meals I’ve had, but lighter. I’m in a state of bliss right now. True soul food. We substituted chili powder for paprika and it still tasted great! We have been cooking it in our family for over 4 decades without knowing that its called “Shakshuka”. We just coined a impressive sounding name to this dish to entice our guests. We called it “Italian Eggs” :). It became quite popular in our friends and family circles with this name. This was delicious! I added some crushed chipotle and skipped the cayenne and the sugar. It was lovely, with the perfect level of spice and a nice smokiness. This will be my new lazy dinner option! Thank you! I discovered Shakshuka only yesterday, and wonder how I could live without it before !!! It will definitely become one of my favourite’s, thanks for sharing. Made this dish this morning! Delicious! My significant other doesn’t like sweet things very much, so I’m always on a search for interesting new savory breakfast options! Mmm this definitely fit the bill. Came together fast and easy, and is super tasty with buttermilk biscuits.